This volume is one of a series of twenty-four from Time-Life Books that chronicles the history and culture of the Native Americans. 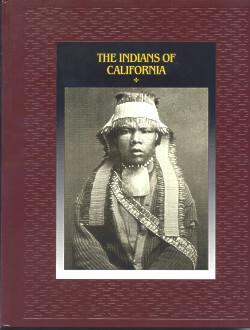 The Indians of California provides information and stories of the vastly diverse peoples of the area now known as California and their interactions with Europeans and gold-diggers, told in admirable detail, often through first-person accounts. Rarely seen, superb archival photographs are abundant throughout, and there are full-color photo essays on the land, types of houses, the White Deerskin Dance of the Hupa people, basketry, mission artwork, the blending of Christian and native religions, the Cupeno struggle for their homeland, and the tragic story of Ishi. An outstanding overview of a complex region, supported by an up-to-date bibliography and thorough index.